This tutorial will set up the following environment. This assumes you have already installed the HTTPD web server. At /etc/yum.repos.d/, create a file named security:shibboleth.repo. Add the following to the security:shibboleth.repo file. Use yum to install the Service Provider (SP). Only install the 32-bit or 64-bit version. Do not install both. Shibboleth will install at /etc/shibboleth. Edit the /etc/shibboleth/shibboleth2.xml and add the IP address of your domain to acl. Edit /etc/httpd/conf/httpd.conf, and ensure ServerName is not commented out. Edit /etc/httpd/conf.d/ssl.conf, and ensure ServerName is not commented out. Assuming you have HTTPD installed and configured for HTTPS, restart HTTPD. 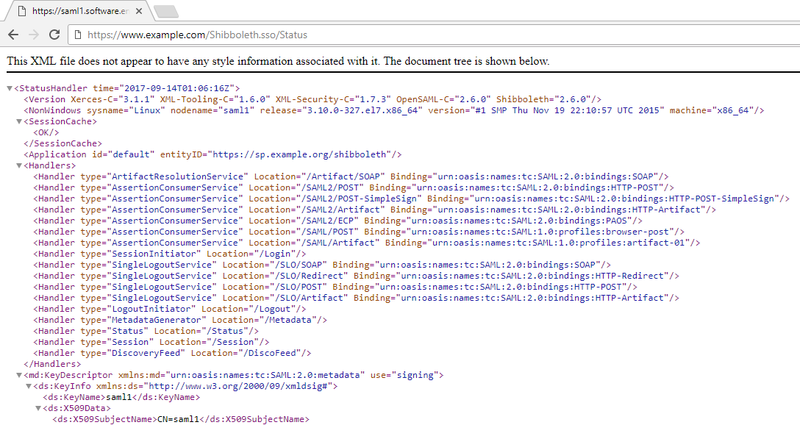 You should now be able to get your SP metadata by navigating to https://www.example.com/Shibboleth.sso/Status.